Yesterday we experienced a total solar eclipse and it was spectacular. Sunday we drove down to Charleston, South Carolina, where we had reserved a room many months ago. Charleston was one of the few major US cities to be in the path of totality so it was packed full of out-of-towners coming in for the event. Sunday night we went downtown and, at the recommendation of some dear family who could not join us, we dined at Amen Street, where we had delicious seafood - some raw, some baked, some fried! And chocolate cake, of course. :-D These family members made reservations for us weeks ago, which turned out to be necessary; our table by the door witnessed walk-ins being turned away over and over again all night. Monday morning we [of course] sought out the best donuts in Charleston. Our research led us to Glazed Gourmet Doughnuts and we were not disappointed! We tried eight of the 13 donuts they were offering that day and all of them were at least very good; a few were even excellent. Their Solar Eclipse donut (glazed with custard then partially obscured by a "moon" of chocolate chips" was really special. Nourished as we were, we finally set out to view the eclipse. 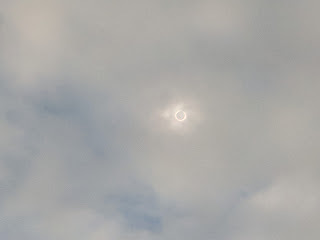 It began ~13:15 local time, although totality wouldn't come until 14:45. For the first hour the cloud cover made it really hard to see (through eclipse viewing glasses, of course!) anything at all. 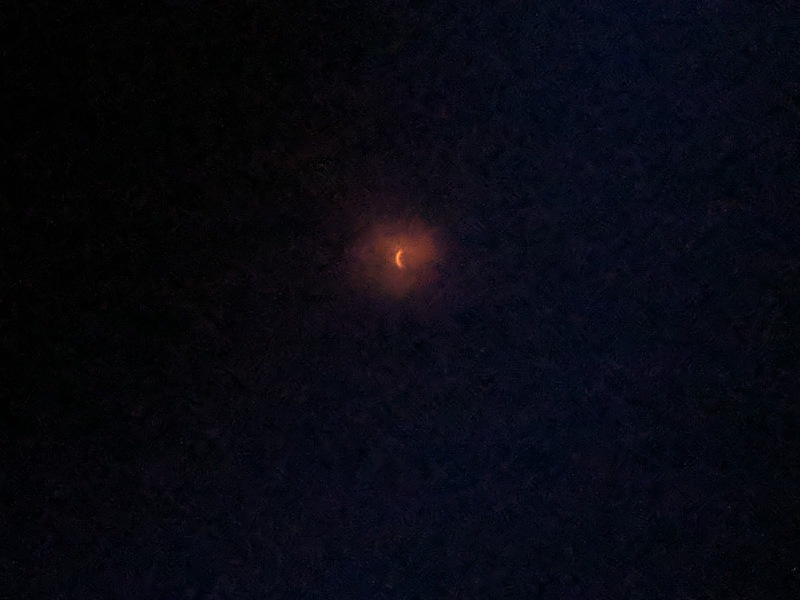 With a non-trivial chance of rain all afternoon, it was entirely possible that we wouldn't be able to see the total eclipse when it happened. The auto brightness of my phone's camera belies how dark things were. It is true what they say, that there is a huge difference between 99% and totality. I didn't notice it as much when everything was becoming dark but afterward, once the sun began peaking around the moon again, it was really impressive. At that point the light came rapidly and demonstrated the stark contrast with the total eclipse. Concentric rings of clouds lit up in rapid succession as the light of the sun returned. We only had totality for around two minutes in Charleston but wow, what an incredible two minutes. It was otherworldly, an experience that I will never forget! We left shortly after the eclipse and managed to avoid predicted heavy traffic. While we were on the road, the heavens opened up on us so we were really glad that the rain delayed just long enough for us to experience totality! Although we were only briefly in Charleston, it is clear that we need to return and spend some time getting to know that interesting town. We know there is more to it than just seafood and donuts!